BlackGirl.WhiteWine. - Basic Invite Review • BlackGirl.WhiteWine. One of the many wedding related expenses that surprised me was that of invitations. Wedding invites can run into the THOUSANDS and your girl wasn’t about to spend THOUSANDS on paper. Wedding invitations are important because they’re the very first glimpse your guests get into your wedding day. However, at the end of the day they do get thrown away. My husband and I wanted invites that were elegant and inexpensive and Basic Invite saved the day. Basic invite had over 1,000 wedding invites to choose from and they were all customizable. I really wanted gold foil invites, to go with our black, white, and gold wedding theme. Although, gold foil invites were expensive on a lot of wedding invitation websites, Basic Invite had cheap options. We selected the Elegant Vintage Foil invitations and we were able to change the wording, layout, and even the kind of gold foil (I highly recommend raised). When it came to assembling and addressing our invitations Basic Invite saved us time. With Basic Invite’s address book I was able to quickly and easily upload over 200 names and addresses. I also have commend basic invites customer service who quickly answered questions we had during our designing process. At the end of the day we were able to get the gold foil invitations of my dreams for a cheap price. And in doing so we freed up money we could spend in other places. Most importantly the invites looked GOOD. We got a ton of compliments, and everyone thought we spent much more money than we actually did. I loved my experience with Basic Invite and even used them for my graduation announcements ( you can read more on my law school graduation here). 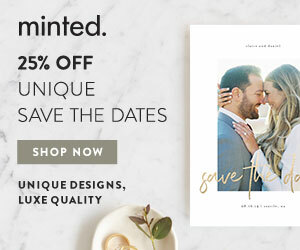 I’ve been recommending Basic Invite to everyone, especially my girlfriends who are currently planning their weddings and trying to save money. I’d love to know what you think about our invites, and please let me know if you have any questions about our experience!